The city of Richmond was built on Dreaming Creek, which had once been a very large stream that flowed through the center of town. It's been compromised somewhat since then, diverted into pipes and shunted behind homes and under streets. A large portion of it was paved over for an Eastern Kentucky University parking lot. 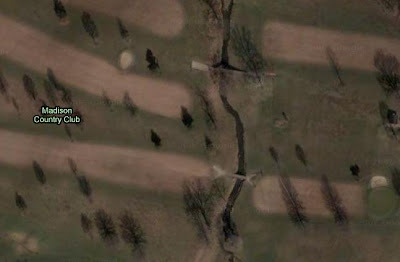 A relatively unspoiled stretch of it can be found at the Madison Country Club, as seen on Google Maps here. Dreaming Creek is so named because of a story Daniel Boone often told. He said that he arrived in this area during a bear-trapping expedition, and after drinking from this creek he grew very sleepy and climbed into a giant hollowed-out sycamore tree to snooze for the night. He dreamed he was surrounded by Indians, who captured him. When he awoke, as Daniel told the tale, he was indeed surrounded by Indians, just like in the dream. However, he tricked them into being caught in his bear trap and made his escape. We'll never know for sure whether the story is just a tall tale that Boone liked to titillate his fans with, or has its basis in truth. And did drinking from Dreaming Creek's waters really induce a psychic dream vision in Daniel Boone? Was there something in it that altered one's consciousness, much like the mysterious vapors of the Oracle of Delphi? Some have ascribed the Delphic vapors to methane or ethylene gas escaping, and that just might be a very similar phenomenon to the many burning springs that once riddled Kentucky's landscape. The stream identified as Dreaming Creek in this blog is just a small branch or ditch that drains into Dreaming Creek. Dreaming Creek is an attractive medium-sized creek which runs along Hwy 1986 for some distance until it empties into Otter Creek. Thanks... I'm trying to remember why I chose this particular branch to show an image of. I believe it had something to do with an old Robert Grise article in the Richmond Register article that I was reading at the time. But I haven't had enough coffee yet this morning to sufficiently flog my memory. A relatively undisturbed section runs behind the Richmond Road Dept. under a 30 foot cliff. Imagine that, a 30 foot cliff in the middle of the city that virtually no one knows about.